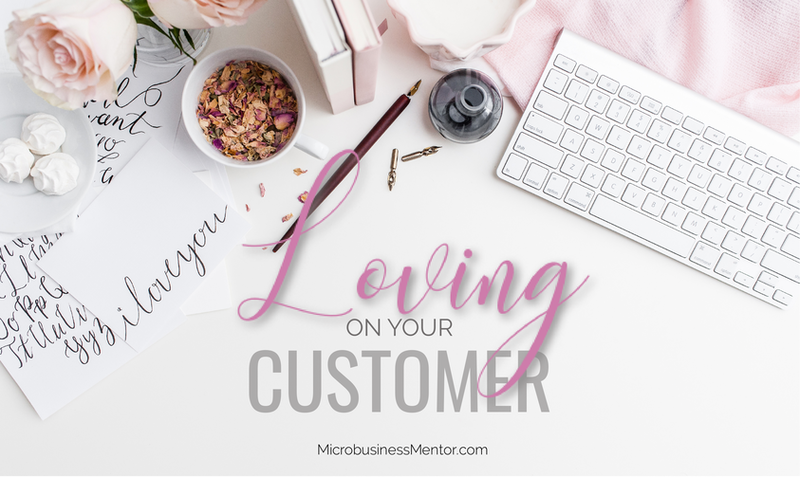 Loving On Your Customers (long after the sale is finished). I’m old enough to realize that good customer service is a lost art and young enough to care about it. Since I’ve started my own business, and especially now that I have chosen to remain, purposefully, as a small enterprise, I am learning the huge value in cultivating an on-going relationship with people long after they were a customer. In other words, loyalty and repeat business comes from loving on your customers. The difference between the good and the great lies in the small details and the extra efforts. I think we all know when someone is genuine. The point of loving on our customers is to let them know that we don’t stop appreciating them when the sale or service is finished. This isn’t about following up so that we can promote our business one more time. Yes, it does keep our name in front of our customers and that is a good thing. But the primary purpose is to simply APPRECIATE. Think of if you were to be on the receiving end of appreciation and there is nothing expected of you. How refreshing!! Here are a few ways you can love on your customer and make their day. Send them a card. Yes, a real, touch-with-your-hands card. I don’t know about you, but I love getting something in the mail that is HANDWRITTEN and isn’t selling me anything. Even better, if it is genuine and nice, it just might be the nicest thing that person hears all day. Take them out to coffee. Obviously, this isn’t doable with larger businesses or a product-based business, but if you are in a service industry where you work with only a handful of clients, why not take them out for coffee once a year? Add an extra gift in their bag or package. When I had a boutique, I would put in a small gift in any orders I shipped out. It would cost me $1-$2 but my customers LOVED it! I’ve also shopped at boutiques before and when I got home I would find a pretty wrapped gift with a little note of appreciation. A little goes a long way! Send an email. If you have ongoing work with customers, sometimes it’s good to pop off a quick email that is non-work related to just let them know you are thinking about them. Follow them on social media. As long as you aren’t acting creepy, why not find their Instagram account or follow their business page, if they have one. I would stay away from a personal profile on Facebook, but Instagram or a FB PAGE, twitter, etc is a safe bet (if you are already active on these channels). Don’t stalk them or promote yourself though. Support their business or cause. Many people have their own businesses or their spouse/partner does. I’m not saying you have to do business with them, but why not follow and engage with their business? Acknowledging their business goes a long way. The very best benefit of taking the time to appreciate your clients and customers is that it keeps your business healthy. How? It reminds us of why we do what we do. When I stop long enough to think about the heart of my business and the people I have helped, I feel refreshed and get a renewed love for what I do. So, if you ever feel like you are on the verge of burnout, take a day off and write a card to as many past customers that you can. Just like that, you’ll fall back in love with your original vision and passion! Pick one or two ways you can show appreciation to a client or customer. Gratitude goes a long way and when it is time to promote your business again or if they need your talents or products, you will more likely come to mind than someone else. If you have other ideas, share them in the comments below or on our Facebook group for microbusiness owners!